Alexandria Bombach (the award winning FRAME BY FRAME) returns to our screens with a moving documentary called ON HER SHOULDERS. 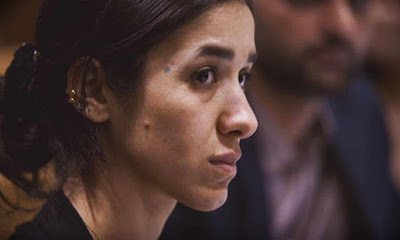 Its subject is Nadia Murad, a Yazidi woman who was captured by ISIS during their campaign of genocide and turned into a slave. Eventually freed, she comes to the west for medical treatment in Germany and begins to campaign for those women left behind, recently winning the Nobel Peace Prize for her efforts. The documentary follows her as she campaigns to have the crimes against the Yazidi investigated and prosecuted. In doing so, she achieves the right to address the UN, and eventually their commitment to start such an investigation. She is aided in this by the human rights lawyer Amal Clooney. Behind the scenes, we see Nadia living a peripatetic life, with no family surviving to help, but one close Yazidi friend. She moves from one small flat to another, one hotel to another, one meeting with an apparently concerned global leader to another. It looks like a very alienating and lonely life. Worst of all we feel the extreme pressure brought to bear upon her and spokesperson for her people, scattered among refugee camps. One of the most provocative things about the documentary is how far it is ironically commenting on the West's need for pretty heroines to break through our jaded cynicism. It doesn't hurt the Yazidi cause that Nadia is pretty, or that Amal Clooney is pretty, and would she have won her slot at the UN had she been plain or old? Would this documentary have been made, and become a hit on the international festival circuit? Given the superficiality and shortness of our attention spans, part of the reason why the future of the Yazidi is on Nadia's shoulders is precisely because she's photogenic and tugs at the heartstrings with her passionate eloquence. These superficial aspects shouldn't matter, but they do. ON HER SHOULDERS has a running time of 95 minutes. It played Sundance 2018 where Alexandria Bombach won the directing prize for documentaries, and then played SXSW and HotDocs. It went on limited release in the USA last year. It opened in the UK and Ireland this weekend.